That must be the same Maurice Ashby that is the father of the current RCME editor and also of David Ashby our host here.........so that's where I would start to locate the plan! Yes, dad's Sleeker, single-channel design. I'll ask him if he still has the mag, Aeromodeller he thinks it was. Thought I had the plan but when I eventually dug it out it turned out to be the 'Sleek Streek' by Peter Holland, DOH. Old age strikes again!!!! David, how about a re-release like you did with the superb "Simplex Pleasures" article? A treat for single-channellers and an optional jellyvator for those who have yet to see the light? Please at least give it a thought! Don't worry about the plan, Ray will be along soon. Ray is the Custodian Of All Things and will be magicing up a copy as we speak! Excellent, thanks Phil. Nice to see it, I was 5 at the time so don't remember that one. It would be nice to re-release it, I'll see if dad's keen. 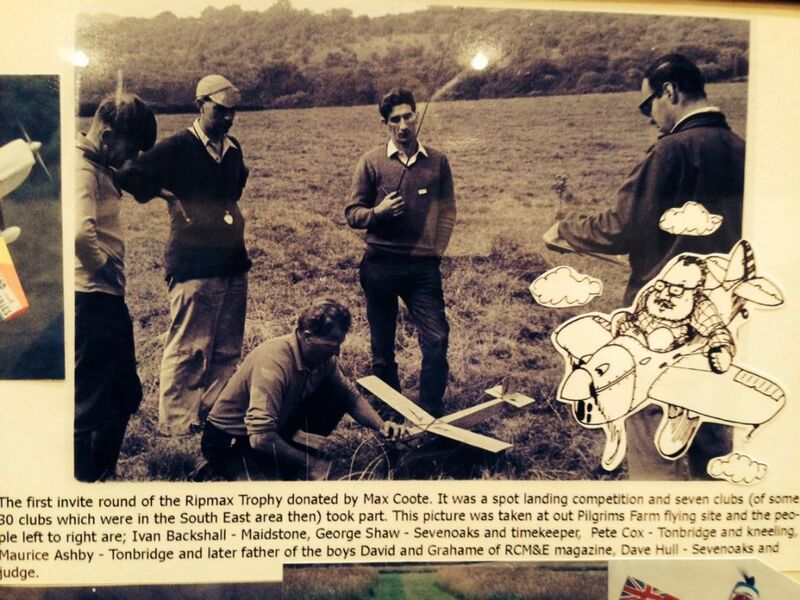 A nice old pic that turned up recently with dad and his pals at a single-channel spot landing comp, Sevenoaks club, Kent in the late'ish 1960s. Dad in the middle with the Tx and Peter Cook kneeling, not as caption. Model is a Simplex of course. Good old days when the hobby was much less complicated... I love to see these old photos! I second Phil G's idea of a re-release of the Sleeker. "Nein danke" for the jellyvator for me though..... unnecessary complication and they will never catch on. Hi guys, 1st, thanks kev b pm sent. This little oldy has stirred a bit of interest up I see. good, as I have just received my balsa/ply/tissue bundle from the lovely girls at balsa cabin so this will be a winter build definately,providing the plan comes through. I have scanned the article (below) from the rcme mag may 1968 if anyone is interested. my .049 (currently in the front of a TOPPER) which is from my cox fledgling c/l. mini servos for rudder/elevator. Any news David? Did your Dad go for the idea? Hmm, still trying Phil. I got a plan and we had a chat over it. He said he designed the model and Peter built the first one. There's a shot of him launching it in the little hardback Radio Control manual that was published at around the same time (the one with the unusual NASA-type models in the desert on the cover) in an article by Dave Bishop on single-chanel comps. I haven't given up....and I did get a copy of the plan for me too. Thanks for trying, but in the often uttered words of many of my school teachers....."Must try harder"